Hiya guys! More snow... that is all. In all seriousness, I'm definitely not asking for more snow here in Jersey. We have plenty and I am sick of it. I need some flowers and sunshine, especially after the whole being sick fiasco. But right now this polish girl can just dream and live through photos of my friends at the Indie Shop Event in Atlanta this weekend, lucky ducks. 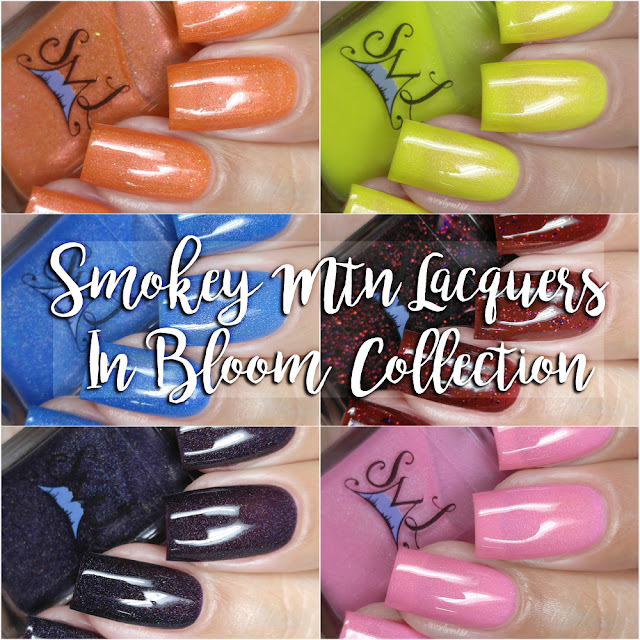 Today I'm sharing swatches for the In Bloom (Spring) 2018 Collection by Smokey Mountain Lacquers, which consists of six gorgeous shades. 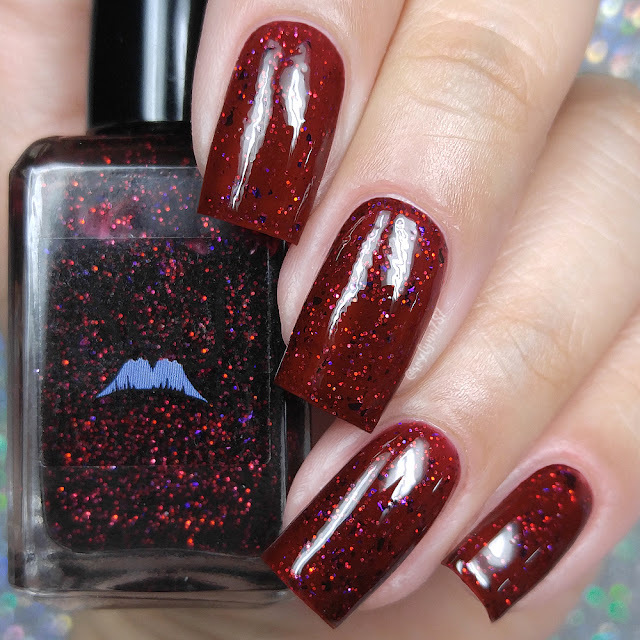 Lots of shimmer, some jelly-loving, and I'm completely here for it. Most of all the color variety makes it so there is something for everyone to love. Let's go ahead and get right into the swatches! The In Bloom (Spring) 2018 Collection from Smokey Mountain Lacquers will be debuting at The Indie Shop event on Saturday, March 24th. Each full-size 15mL shade will retail for $10 at TIS. These will be available for purchase online at a later date - will update and let you guys know when. Amaryllis can be described as a peachy coral holo with a red flash and gold holo micro glitters. Long time readers here will know I'm not one to go crazy for an orange shade. But there is always the one that breaks your preconceived notions and this is the one for me. It's that perfect medium between being too bright or pale, which makes it perfect against my skin-tone. The slight touches of micro glitters give the finish a nice touch and pop factor. It doesn't overcrowd the nail or make it appear too textured, it's the perfect balance. The formula has a good opacity and builds-up easily for full coverage. In person there is a minimal visible nail line, but it really isn't noticeable unless you stare. Like intensely... aka like I do while in bed haha. Consistency wise it leans a little on the thick side, but it's manageable and doesn't need any thinner added. It's almost the odd one out of the collection as the finish tends to feel almost creamy to an extent. It dries down to a minimal gritty finish that smooths out perfectly after topcoat. Shown here in two to three coats and sealed with a glossy topcoat. Hibiscus can be described as a blue holo with purple shimmer. You know it guys... favorite alert! It's so hard to resist, I'm a big fan of blue and shimmer. This beauty has both, haha. The tone of blue is actually really cute and not something I can match to any in my large collection. It fits perfectly for the season whilst still being perfectly wearable year round. Sure it's nothing too complex, but the shimmer gives it enough of a 'pop' factor to make it eye catching. And it looks great against my skin-tone or any skin-tone in fact. Got to give it the must-have stamp of approval, I think you guys will really love it! The formula has a very sheer jelly-like application that builds-up nicely for complete full coverage. I was so pleasantly surprised by how well and evenly it layered. The consistency leans on the thick side, but it's manageable and doesn't need any thinner whatsoever. It dries down to a smooth high-shine finish on its own. I'm also happy to say I experienced no staining on removal to my cuticles or nail beds. Always a pleasant surprise when it comes to a rich blue hue like this one. Shown here in three coats and sealed with a glossy topcoat. Hyacinth can be described as a blackened purple holo that is black light reactive. I ended up breaking my only black light bulb and not having time to grab another in time to test that aspect out for you guys. That said, this actually ended up being another one of my favorites from this collection. Photos don't do the unique hue any justice especially not to the sparkle. It's one of those colors you didn't know you needed until you have it on your nails. Works great for any occasion at any time of the year. Plus it looks fantastic against my skin-tone! The formula has a sheer application but has more opacity than any of the others in this collection. It has the feel of a jelly without any of the normal sheerness you'd expect. Perfectly balanced consistency, not too thick or too thin. It layers easily with great self-leveling throughout for full coverage. It dries down to a smooth high-shine finish on its own. Also I experienced no staining on removal to either my cuticles or nail beds. Shown here in two coats and sealed with a glossy topcoat. Orchid can be described as a pale yellow with a red/pink flash and red/pink shimmer. And here we have the one that completely and utterly stole my heart and soul. Seriously... a yellow polish made me fall in love and I am shook. There will never be a day when I don't love a polish that can come in and swept me off my feet. Since yellow isn't a color I am prone to get too often it feels very unique to my collection. The hue is perfect for this time of year and has a lot more shimmer shift then my photos could capture. It looks great against my skin-tone even if it does bring out some warmth. This is just one of those times where it doesn't matter because the polish is too stunning to resist. Definitely has my must-have stamp of approval. The formula has a very sheer application as intended for a jelly finish. Although it builds-up nice and even, it does show a minimal nail line for me. The consistency leans on the thin side, but it's manageable and doesn't pool to the cuticles. Super easy to work with and layer for coverage. It dries down to a smooth high-shine finish on its own prior to topcoat. Shown here in three coats and sealed with a glossy topcoat. 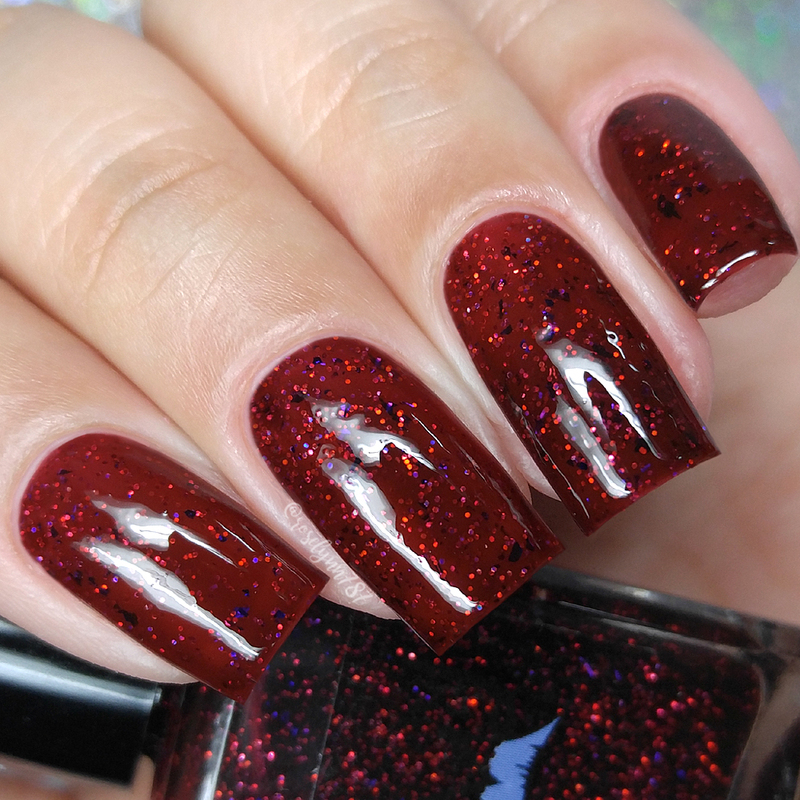 Rose can be described as a deep red/wine with red and pink holo micro glitters and purple to red UCC flakies. Unfortunately this one would probably have to be my pick as least favorite among the collection. I would have much preferred this combination with more of a crelly finish instead of the jelly. It didn't end up working well for me, though that's just my personal taste and not so much fault of the polish itself. That said, red is a winning color that tends to work against any skin-complexion. I love the way it looks on me and it definitely has much more sparkle than photos could capture. The formula has a very sheer application as intended for a jelly finish. However it did feel just a tad more sheer than a lot of the other jelly finishes in this collection. Despite all the micro glitters, it has a nicely balanced consistency that is neither too thick or too thin. It dries down to a minimal gritty finish that can be smoothed out after topcoat. It ends up looking more textured than it actually is due to the amount of micro glitters in the finish. I experienced no staining on removal to either my nail beds or cuticles. Shown here in three coats and sealed with a glossy topcoat. Tulip can be described as a pale pink holo that is black light reactive. Once again I couldn't test out to see how it looked under black light and I am so bummed out. Before I talk too much about the color I do have to say it's a bit more pinker in person than my photos. 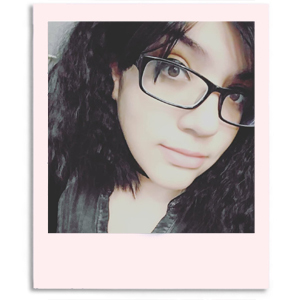 In either case however the tone of the pink does not compliment my skin-tone as well as I hoped. It tends to bring out a little too much warmth for my personal preference and isn't something I would normally wear. That said, I'm betting this will look drop dead gorgeous on a darker skin tone than mine. The formula has a very sheer application as intended since it's a jelly-based finish. The consistency, like much of the others, has a well balanced feel and applies with ease. It builds-up really good coverage, however, my nail line is still visible even after some layering. Out of the whole collection it has the most similar feel to that of Orchid. It dries down smooth and to a natural high-shine on its own. Shown here in three coats and sealed with a glossy topcoat. To recap, the In Bloom (Spring) 2018 Collection from Smokey Mountain Lacquers will be debuting at The Indie Shop event on Saturday, March 24th. Each full-size 15mL shade will retail for $10 at TIS. These will be available for purchase online at a later date - will update and let you guys know when.